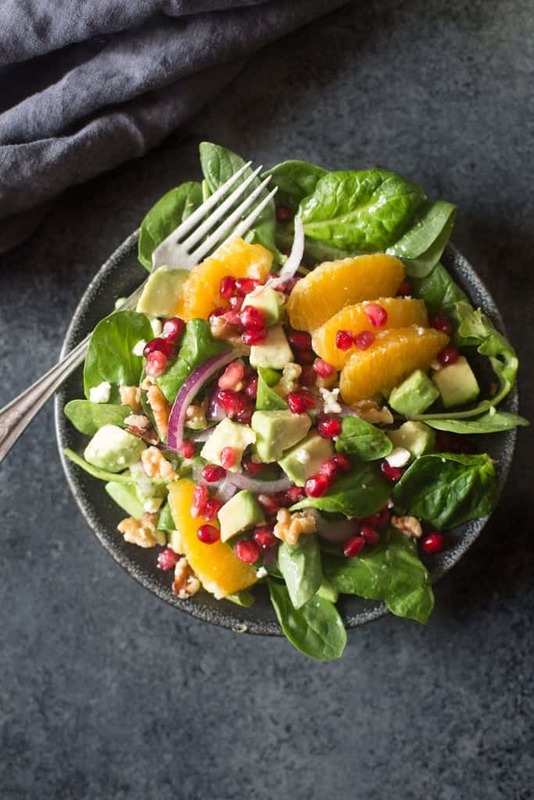 This Orange Pomegranate Salad is the perfect easy holiday side dish. 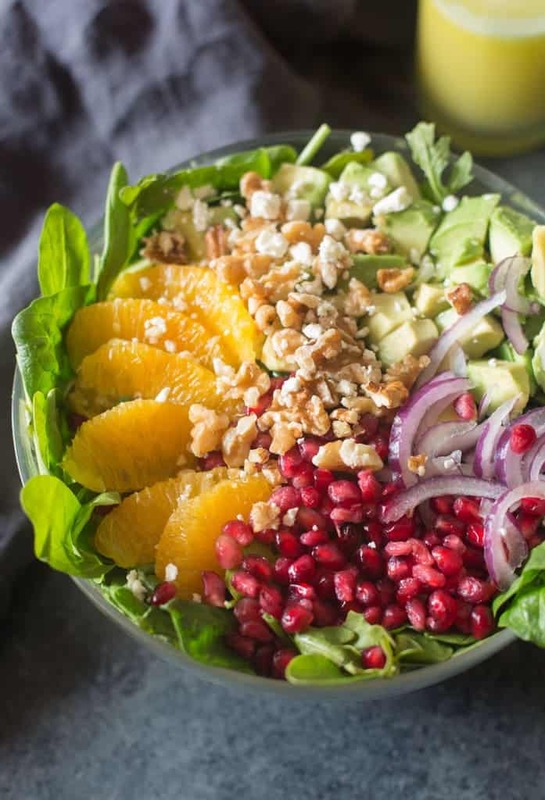 Layered with sweet pomegranate arils, avocados, fresh oranges, thinly sliced onions, toasted walnuts and feta cheese. It has the perfect crunch and sweetness to accompany any dinner! Hooray for pomegranate season! I honestly think I love eating pomegranates on my salads more than anything else, but I also can’t ever resist this yummy Pomegranate Berry Smoothie–YUM. My kids love to eat them plain, with a spoon, or even tossed in their Greek yogurt for breakfast. They are such a treat, and I love how festive they make everything–especially salads. One of my friends was recently telling me how she’s the “salad or veggie tray” girl at every family party. She’s never tasked with making any of the more important menu items. I told her that next time she should blow everyone away by bringing the most gorgeous, amazing salad or veggie tray they’ve ever seen! 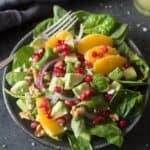 I feel like this Orange Pomegranate Salad completely fits the bill for being beautiful and impressive looking, DELICIOUS, and super easy, all at the same time. If you’re not sure how to de-seed a pomegranate, or even if you have a method, check out my tutorial for how to easily de-seed a pomegranate! I like to use a mix of baby spinach and arugula for this salad, but any greens would work. Also, you can make the dressing a few days in advance and store it covered in the fridge. Lastly, if you have time, try toasting your walnuts before adding them! It adds great extra flavor. Just throw them on a skillet over medium-high heat, tossing them gently for a few minutes, making sure they don’t burn. 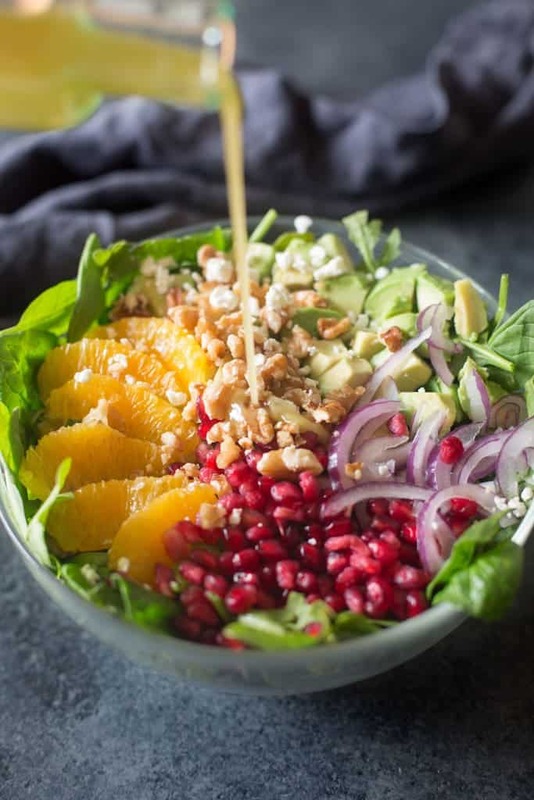 I absolutely love the sweet, tangy, and crunchy combinations going on in this salad. It’s so fresh and light. The dressing is particularly fresh and light, as you will notice, and coats everything perfectly. How perfect would this salad be as a side in your Thanksgiving feast, or on the side of your Christmas ham? It’s the perfect festive holiday side dish! 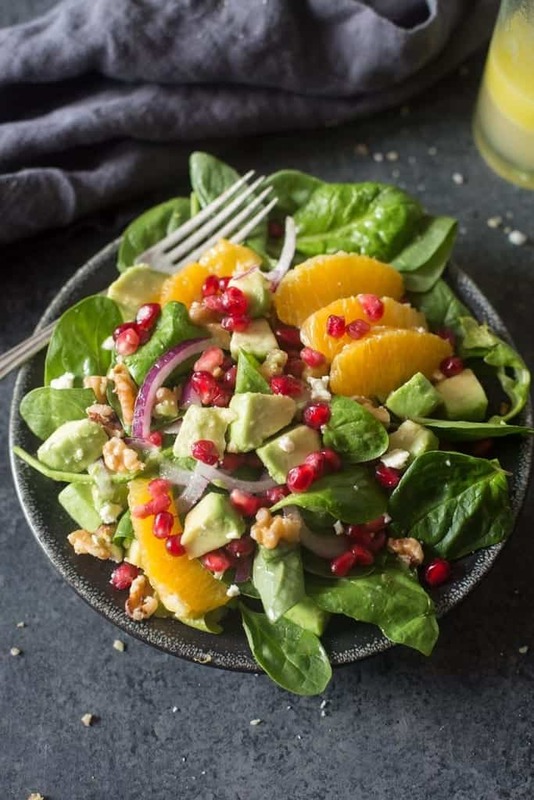 This Orange Pomegranate Salad is layered with sweet pomegranate arils, avocados, fresh oranges, thinly sliced onions, toasted walnuts and feta cheese. 1/3 cup walnuts , I love them toasted! Add all of the salad dressing ingredients to a blender and pulse a few times until smooth. Taste and adjust as needed—more vinegar, orange, or honey, depending on your preference. Refrigerate until ready to use. This may be made a few days in advance. Meanwhile prepare the salad ingredients. Easily de-seed your pomegranate by following this tutorial. To slice the oranges, cut a slice off the top and bottom of each orange to expose the flesh. Place the oranges upright on your cutting board and, following the contour of the orange, slice the peel off to expose the flesh. Then cut along the sections of the orange into slices. Rinse and pat dry the lettuce and add it to a large mixing bowl. Drizzle the chopped avocado with a little lemon juice to keep it from browning. Add remaining ingredients and gently toss to combine. Drizzle desired amount of dressing on top and toss to evenly coat. Serve immediately. This is perfect healthy brunch also ! Thank you. I love combining feta and walnuts. The rest of ingredients makes it to be an absolute perfection. All the best ! I’m head over heels for this salad! The dressing takes it to the next level!! Best salad ever! I love the toasted walnuts!